Sandwiched in a narrow corridor between Bavarian Germany and Italy, western Austria is dominated by a beautiful stretch of Alpine mountains and colored by the two lively cultures. 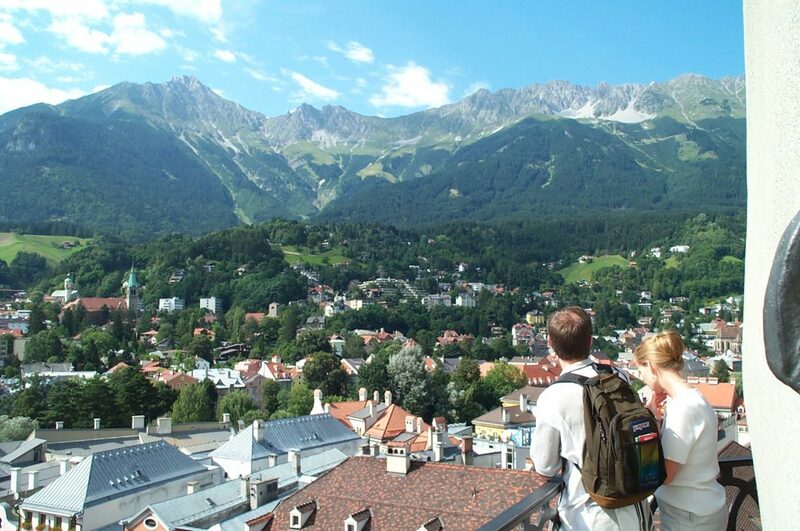 In the middle of it all is the scenic valley city of Innsbruck, surrounded by breathtaking beauty and filled with activity. 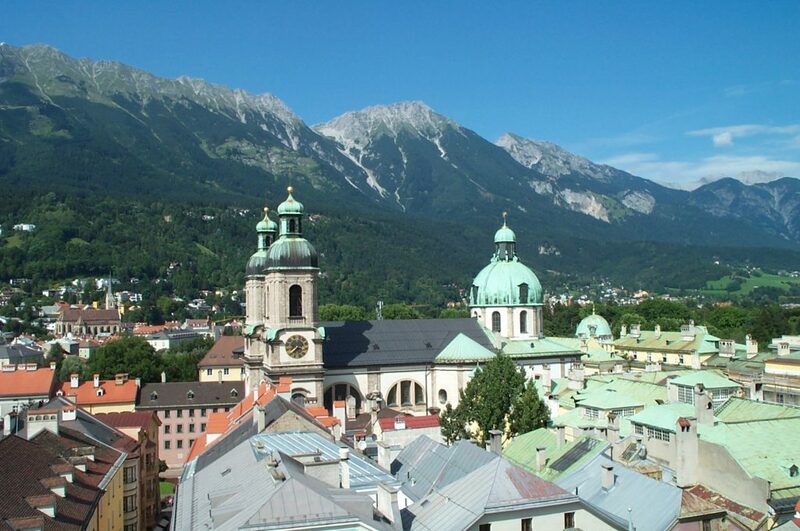 My visit was relatively short, so I concentrated on the Old City, or Altstadt, nestled along one bank of the Inn River (from which the city draws its name — Innsbruck, or “bridge over the Inn”). I was very fortunate to enjoy an absolutely gorgeous day with perfectly blue skies. The Old City consists of four large square blocks of pedestrian traffic, sidewalk shops, and eateries galore! 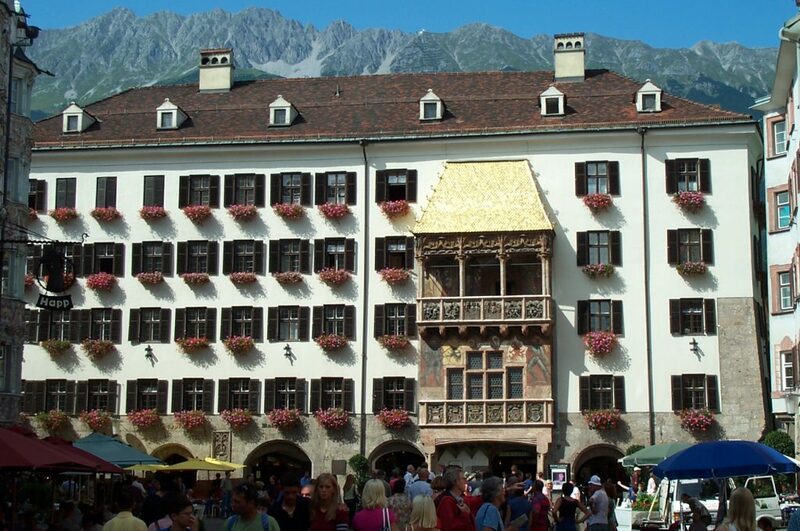 Innsbruck has a bright mix of colors in its architecture — with old stone buildings mixed among teal apartment buildings, purple coffee houses, pink churches, and the grand Goldenes Dachl on the Rathaus (town hall), shown above in the first photograph. This building marks the city’s main square and the center of the high-end shopping district. Most of the other buildings along the main square were elaborately decorated with murals on the walls or extraordinary window moldings. Overlooking the market square was the Stadtturm, which hosted an observation deck, so naturally I climbed it. The second and third photographs show views from the Stadtturm — one pointed over the city and towards the Tyrolean Alps, while the other pointed the opposite direction toward the Dom St. Jakob. Most of the city’s other attractions are easily located, such as the Landestheater and Hofgarten along the river to the north. In the latter photograph, you can see how so many of these old metal rooftops have turned green over the years. I followed the road from the Rathaus front towards uptown. The pedestrian section ended near the Annasäule, (a white column sculpture commemorating the Virgin Mary dedicated on St. Anne’s Day in 1703, according to the Innsbruck tourism website) that split a boulevard of both road and trolley tracks. Horse carriage rides were available nearby. At the end of this street stood the Triumphpforte, a small Arc-de-Triomphe-like structure that commemorated the death of the Austrian Emporer Franz I. Both monuments were brilliant white. On one side of the road was a pink stone church that almost seems to have been absorbed by the urban sprawl. I ventured further out of town to check out the architecture, and even there (where few tourists dared to tread), the buildings remained huge and colorful. Even the Austrian telecom building looked like a palace (though it sat at the base of a very modern and not altogether pretty communications tower). The next part of the tour was along the river. The fourth photograph shows a shot of the Inn following the Promenade that surrounded the city. This shot was taken not far from the parking lot I used (by the way, I have found that Austrian parking lots are incredibly tight and my car barely qualified as ‘midsize’), pointed in the general direction of the Old City. Directly behind me was a sharp bend in the river, above which was the Olympic site in the Bergisel. Along with St. Moritz and Lake Placid, Innsbruck has hosted two Winter Olympiads, in the years 1964 and 1976. 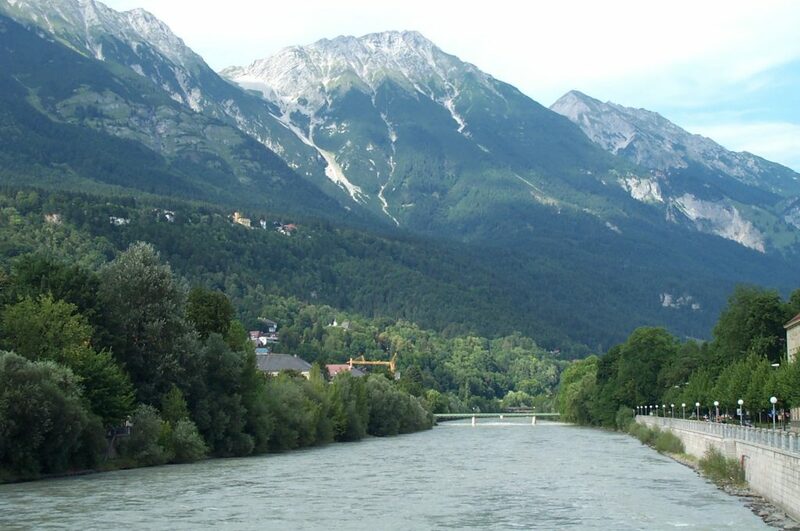 The City payed homage to its Olympic heritage with several attractions located in the Bergisel. These include the Olympic Ice Stadium with speed skating oval (open year round), a ski jumping ramp, and an artificially-ice bobsled and luge run. The promenade was lined with parks and a few riverside cafés, and people were out walking it in numbers. In the distance of the fourth photograph, near the walking bridge, the river hooked a sharp right toward several attractions — the Hofgarten, Kongresshaus, and Landestheater. The Hofgarten was in full bloom, and sculpted flower gardens made for a colorful and pleasurable walk. The most memorable part of the garden was the incredibly tall red roses. 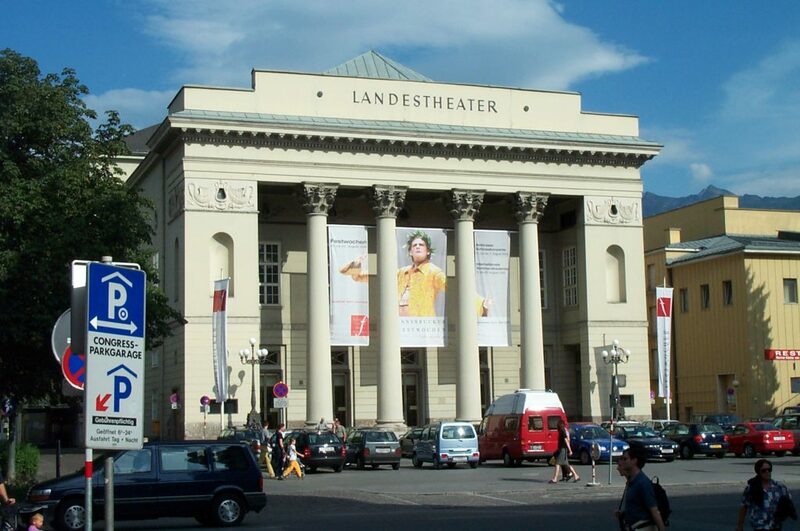 The fifth photograph shows the front of the Landestheater, a beautiful white-columned structure located near the Hofgarten. As I would discover in my various trips around this beautiful country, Austrians love their art — music, theater, painting, etc. This was only a short tour of the downtown, so there were several attractions I did not get to see. These include the Ambras Castle to the southeast (about a ten minute drive from the old city), the Olympic grounds themselves, and the Riesenrundegemaelde to the north — a thousand square-meter wall mural depicting the famous battle of Bergisel in 1809. Hopefully, someday I’ll get back there and be able to devote a longer time to exploring the city. I just hope I pick another fantastically blue-skied day.